The price of an ounce of gold surged over $125 an ounce since the start of 2017, for a roughly 9% gain. That's an impressive move. If you bought an ounce of gold at the beginning of the year you've baked in a nice return. What are a few factors that moved the price of gold this year? Let's take a look. Tensions have never been higher with the rogue nuclear-armed nation of North Korea. The country fired 23 missile tests since February. “Most Americans don’t realize how close we are to war," said Illinois Senator Tammy Duckworth. Gold is a traditional safe-haven and investors turned to the metal as various Twitter exchanges between President Trump and North Korean Supreme leader Kim Jong-un ratcheted higher throughout the year. The leaders of the two countries exchanged threats and taunts, including "dotard" and "Little Rocket Man." "The key problem for the United States is the likely possibility that North Korea has the missiles to deliver nuclear bombs to South Korea and Japan. If one of these weapons were to reach its target, an entire city would be annihilated," noted a New York Times article December 6. The U.S. dollar index fell 12% in 2017. A weak dollar is good for gold, but a signal of underlying weakness in the U.S. economic, political and perhaps even military might. A weaker dollar makes gold cheaper for foreign buyers, who used the lower prices to snap up the precious metal at bargain prices. However, the weaker U.S. dollar trend is a negative sign regarding international views of our country's economic, political and fiscal policies. The level of a nation's currency is a type of "grade" on how the country is viewed versus other countries around the globe to international money managers. Gold is a currency with a nation and without any of the fiscal obligations (or debt) that come with various governments around the globe. The aging bull cycle in U.S. stocks hit its eighth anniversary in 2017. By traditional valuations, the stock market is overpriced and overvalued. Just how overvalued is the U.S. stock market right now? "Shiller’s cyclically-adjusted price/earnings (CAPE) ratio for the S&P 500 has climbed to around 32. The last time it rose to such a high level was in the late 1990s, shortly before equity prices in the US plunged," wrote economists at Capital Economics on December 18. The gold market climbed over 9% this year, alongside an exuberant stock market. 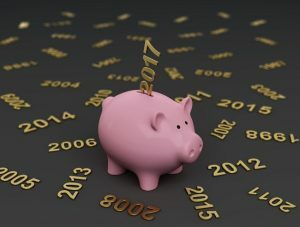 Investors turned to gold this year, as a way to take some risk off the table, with equity prices at sky-high levels. The Federal Reserve hiked interest rates three times in 2017, in March, June and December. Yet gold prices continued to climb despite the Fed's move. Why? Because official interest rates remain at historically and abnormally low levels, with the Fed funds rate at 1.50% to end the year. Interest bearing accounts offer little return and risk levels in the stock market are at the highest level in over a decade. Investors continue to turn to gold as a hedge against a depreciating U.S. dollar and a hedge against stock market declines. In late December President Trump signed into law a $1.5 trillion tax overhaul package. The stock market climbed as corporations receive a massive tax break, which could help the Price/Earnings ratio of publicly traded companies. Gold also climbed higher in in the second half of December. Many economists believe that this tax package will ultimately spike the U.S. deficit – already at $20 trillion even higher. That's gold bullish. The New Year is just around the corner. If you are making resolutions for 2018, purchasing gold right now could be one of the best ways to kick off the New Year right. Protect your assets. Hedge your risk against an aging, overvalued stock market. Make 2018 your best financial year ever.